Silly Americans. Book and effigy burnings are for Islams! I think a nice protest would be to move all religious literature into the fiction section of bookstores/libraries. When will people learn – don’t burn the book, burn the printing press! Burning Korans just looks like increased Koran sales. Well, that and cretins provoking morons. Great. Super headline but wrong newspaper! Hmmm, you spelled Mormons with only one “M”. Is that one of their sub-sects? Lo, we will always have cretins and morons with us! Not looking forward to the rampaging, however. Thanks, Author. At least they’re not throwing cats in bins. That would be inexcusable. Not even Hitler was that craven and *he* had books burned. Is this the first prophecy by Jesus&Mo? Because I’m pretty sure it will come true. I’m as afraid as Jesus. Is somebody actually planning a mass burning of the Koran? If so, the headline is more than appropriate. Does anybody have a link to this initiative? I suppose I could google it. @DH – sorry, I forgot the link. Yup. There it is. Cretins provoking morons. Great strip, Author. Mormons are “Morons” (their angel was named Moroni)…. “Where books are burned in the end people will burn.” Heinrich Heine. First they burned his books and then his fellow Jews. Will they ever learn? I doubt it. Excellent plan! Though, to make the workload slightly easier, just bring “Fiction” placards to the bookstores and replace the “Religion” and “Religious Studies” and “New Age” ones. And meanwhile, comb the Science sections and get rid of the new age slime that keeps sneaking in there thanks to misinformed bookstore employers and/or employees. Those can go in the new Fiction sections, as well. YES!! lets burn koran books and satanic verses. In norway we dont need the koran book. If it getting cold as hell this winther we all Burn koran book, to get warm inside our homes. Someone should sneak a few Arabic language bibles into the pile. It could end like an episode of The Waltons. This story made me think that we should revive Roman style gladiator contests. Those godidiots who are sufficiently hate filled could be invited to fight to the death armed with a baseball bat and an old style galvanised steel dustbin lid. Eventually all the really rabidly mental ones would be gone and the rest of us could then get on with our lives in peace. As a bonus: Mel Gibson could play himself in the eventual movie. If he’s among the survivors. If not…oh, well. some of these so-called christians should just walk around naked with bones through their noses like cavemen. they’d be more credible. Just saying; we crazy Norwegian humanist felt compelled to be left outside. Everybody was burning others important papers, and nobody ours! So we burned the Norwegian Humanist Manifesto in protest! Regrettbly there are still barbarians who have no respect for others, but demand it from every one. Evolution is a slow process, intelligent design isn’t working very well either. I recalled that this FL church was in the news earlier this year for protesting Gainsville’s openly gay mayor, and was joined in the effort by the nutjobs from Westboro Baptist church. So I wrote a quick news spoof about the two organizations merging. Sometimes things get so ridiculous the best one can manage is to laugh at them. Actually, disappointed with this. Lacks the subtlety of which the author is a master, usually. @Sach Sorry you’re disappointed. IMHO the headline is worth any lack of subtlety. Some times you just have to call it as you see it. Good call, author. If the loon who started this had a ounce of common sense he’d say something along the lines that “If the Koran really is a sacred book the Allah will put out the flames to protect it”. OBL could then offer the same challange to God and burn some Bibles. I personally will burn a copy of “The God Delusion” and prophesy that if Dawkins et al are right it will be reduced to a pile ashes. And I thought I was the only one who thought Jeffrey Archer’s books are crap. @Nassar. Who are the barbarians? The idiots in Florida or the idiots who are calling for blood if the other idiots burn their fairy tale book? Courage, Atheismo – there are many like you who think that Archer, Dan Brown, Wilbur Smith et al are utter balls, worshipped by mouth-breathing clots, and increasingly we are not afraid to admit it. Freereaders unite! As a kid, I was taught that christianity was “right” (well, my brand of christianity, anyway) and all other religions were “wrong”. Thirty years later, including four spent at seminary, I realise that all religion is man-made. True, I fought that realisation like hell at first, but in the long run, you really can’t deny the truth: religion on the whole, and fundamentalism in particular, is a sick joke foisted on the gullible by the opportunistic. The author is echoing the prophetic sentiments of the US chief of staff in Afganistan: if these cretins provoke the morons, there will be bloodshed. Damn, they beat me to it. I had some kind of a vague idea of embarking on a wild book- and symbol-burning spree (You know us germans: Once we start burning books, there’s no stopping us.) including some of the following: The Quran, the bible, the thora, the Bhagvad Gita, The Origin of species, Von der Elektrodynamik Bewegter Körper, The God Delusion, the American Constitution, the Comunist Manifesto, Theodor Herzl’s The Jewish State, the flags of the USA (probably the most frequently burned flag in the world), Israel (another good contender for the title), Iran, Germany, Denmark (has been winner of the yellow jersey for a few months), a Hammas bandana, a Tibetan prayer scarf, a crucifix and a small buddha statue. It’s just stuff, it doesn’t hurt anybody if you burn it. Just don’t hurt people. Oh! And a Muhamad caricature! First to draw one, and then, when it has become a symbol of free speech, to burn it. That’d be fun…. @stonyground ~ an idea I’ve held for a long time, although I think the spectators should all be armed too!! Would make for better (and more useful) Sunday afternoon TV than either the American WWE or European Football matches !! I want to run the sports book on it though. LOL!! @stonyground – I’ve been pitching basically that idea for a real reality tv series for years. the participants are voluntary and anyone who isn’t willing to live peacefully with everyone else is encouraged to sign up. there’d have to be commerical breaks to remove bodies and replenish the ammo. That part of the US was routinely lynching people up until the 1930s or so. Burning books instead of people is progress for the right-wing wacko contingent. My country makes me sad sometimes. 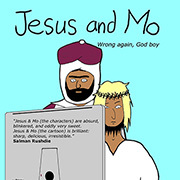 “Jesus and Mo” has been included in this weeks Sites To See. I hope you like the image I featured, and I hope this helps to attract many new visitors here. @ Cygnia. Burning may not be enough. The readers of Twilight–in fact goths generally– may have to be hunted down and persecuted too, to stop the infection spreading. Kinda like 28 days later, but much more annoying. What about that, Mr. Jones? Mr. Turner has a very intriguing idea. What I was going to say before I read his comment, and is still a reasonable idea in my opinion… As long as the government speaks out strongly that they disagree with the burning (of any books), but allow it to happen without restriction, we stand up for our own values as a secular nation. After all, they are just words on paper. If a muslim country wants to respond by burning bibles, cool, they are also just piles of paper (any response beyond that, though not surprising, is deplorable). Jerry: But, I don’t belong to any religion. God: I’ll let you in on a secret – neither do I. Did one of you gals link to this? Amazing how much press the whole thing has gotten. It was obviously a great publicity ploy. Now the guy should just put it on youtube, place a few ads, and monetize it! I don’t want to see christians burning korans. I want to see muslims burning korans. If the man wants to burn books, and it’s not against the law of his land to do so, then is is free to do just that. That’s what freedom means. People who value freedom acknowledge the rights of people who wish to exercise their freedoms. Is there any more to it than that? It occurs to me that everyone going on about how this is going to cause deaths in Iraq etc is missing the actual cause. This church is 50 idiots in some small town, it’s the way it’s being covered by the media that’s actually going to cause problems. If they’d just ignored them no-one would even know about it and they’d just have wasted their budget. Today’s Telegraph has a piece about someone who smoked pages from both Koran and Bible, to find out which is best…. It says that YouTube has deleted the resulting video. What if some one wrote a story about a person drawing a cartoon that showed the burning of a koran, would that be something that the Sharia sect would be up in arms about? Since there was no burning because there was no koran and further, no actual cartoon, would the author of the story still be stoned? I’m just askin’………..
@jerry w It depends. 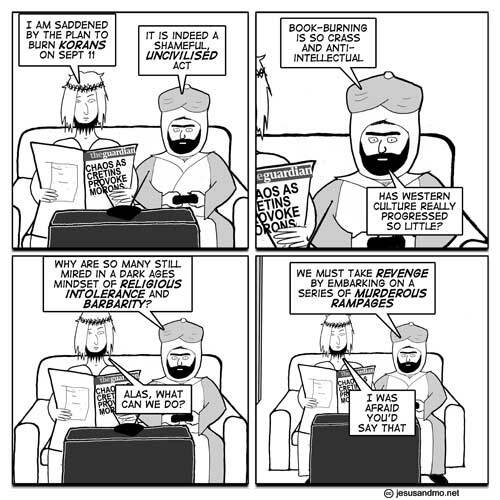 Where’s Mohammed in this fictional cartoon? What if someone drew a cartoon of someone writing a story about a person drawing a cartoon that depicted someone burning a koran? I’ve posted this strip a number of times to Facebook, but now when I try to do it, Facebook gives me an error message saying that “this message contains content that some users have reported as abusive” and I can’t post the URL anymore. WTF?!?!? “It’s just a little bit of history’s repeating itself”!